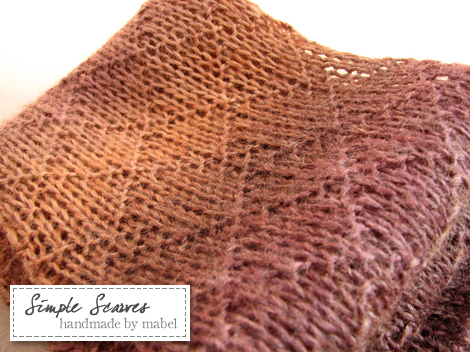 Scarves – it was the first item I had ever knitted. I remember my first scarf – I knitted it too wide and a little short with some loopy Patons yarn. I was in Australia then and recently, I felt like going back to the basics. Scarves can be pretty complicated depending on what pattern and how you want to knit it. I kept things pretty simple with this diamond stitch pattern I got from a stitch dictionary. The width is determined by how many stitches you casted on; in my case, it was less than 30. I must apologize for the estimation – it has been a while since I knitted this and some of the details are hazy to say the least. Anyway, here’s the pattern for those who are interested in knitting up some diamond skinnies! About 180 metres (195.5 yards) of Rowan Tapestry in Rustic but you can use any type or weight of yarn. If you plan to make this wider and/or longer, allow for 200 to 350 yards of yarn. Gauge doesn’t really matter. If you want a frothy scarf, use light-weight wool and bigger needles. 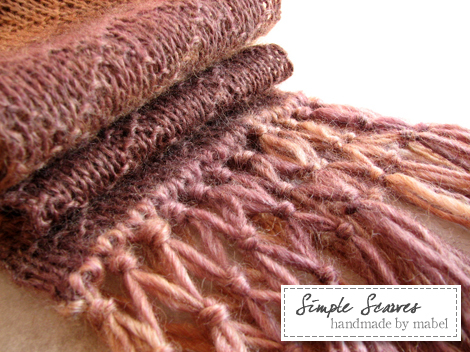 If you want a heavy, tighter scarf, do the opposite – heavy-weight wool and smaller needles. Repeat Rows 3 through 10 for pattern until you reach the desired length. Bind off and add the fringe with additional yarn using a crochet hook. Wash and block to open up the diamond pattern and avoid the tell-tale side curling in of stockinette stitches. 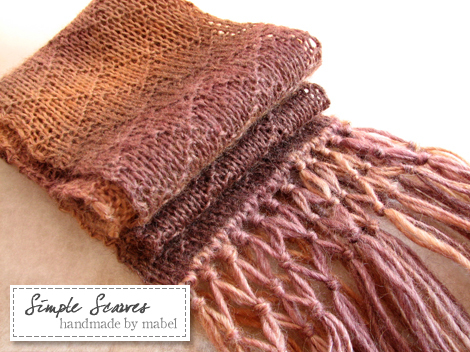 Beautiful scarf, I am a beginner and am going to attempt it…wish me luck!! Adele: Let me know how it goes, k? Lina: Hi Lina, the pattern is basically a multiple of eight stitches plus one, meaning that when you cast on the stitches for a scarf, the total should minus 1 and then the remaining figure be divisible by 8. For example, 33 cast on – minus one and you end up with 32 which is divisible by 8. That’s all. If you wish to have five repeats, just multiple 8 by 5 and add 1. Hope this helps! oohhh i think i get it now XDD so like..let’s take row 3 for example. well like..in the beginning, i cast on stitches with multiples of eight plus one, like 25. then wen i make row 3, i would k4 [p1,k7] k4, but like wen i repeat the [p1,k7] i do p1 then end it with k4? lol i’m sry if i’m confusing youu XDD thanks for ur help earlier anyways! =] loving this scarf more && more! I am confused with the pattern as well. not all rows work out evenly. it is gorgeous and id really like to try it, but for instance if cast on 33 stitches, rows 1,2,6,7 can add up to 33, but rows 4 and 5 do not (32 and 30, respectively) how do i account for those stitches? I really wanted to try this scarf, but like Lina, it doesn’t make sense to me. If you do a multiple of 8…lets say your example of 32, plus one so you cast on 33. Molly: All I can say is don’t count…I know that sounds really confusing and all – I counted the stitches based on the stitch pattern & chart and it didn’t make sense. When I knitted it, it just came up right. Ilene: All I can say is don’t count…I know that sounds really confusing and all because that’s how I felt when I started – I counted the stitches based on the stitch pattern & chart and it didn’t make sense. When I knitted it, it just came up right. Lovely scarf! Would really like to try it. But what do you do with that extra stitch in row 3? There are only instructions for the first 32 stitches (if for example you take a multiple of 3, 3×8+1+33). Do you just drop it, or knit it? Thank you very much for posting this scarf. Mir: Thanks for the compliment but really, my best advice is don’t count…it sounds confusing and all but that’s how I felt when I started – I counted the stitches based on the stitch pattern & chart and it didn’t make sense. When I knitted it, it just came up right. Just follow the instructions and you’ll do just fine. It’s beautiful but I’m worried about the edges curling even after blocking. Would it be possible to add edge this to the scarf without messing up the look? Row 1: knit one stitch, slip next stitch to right needle without knitting, knit one stitch. Knit rest of row to last three stitches, repeat k sl k.
Repeat these four rows for your edges. The slipped stitches get a little twist on the even numbered rows which helps hold the curl in check. These edge stitches still curl around, but with an interesting effect, in that the edge gets a nice row of stitches. I am a knitting newbie but i tried this with a half bamboo half silk yarn and it is looking gorgeous! I am using the corrected version above…anyway to bump that up to the top? Am glad you love the pattern! I believe I have left some links to the pattern on the sidebar (under the Freebies comment) so for now, no plans yet for a bump for that to go on top.